The use of the Membrane Interface Probe (MIP) as a screening technology for VOCs has been established for over a decade. Numerous site conceptual models have aided by this high-resolution tool leading to expedited source area identification and delineation. The advantages and disadvantages of the technology have been well documented, though often not accurately or appropriately. The development of Low-Level MIP technology represents a significant step forward in capability if properly configured and operated. Low-Level MIP provides an order of magnitude improvement in the performance; and often expands the technology’s detection capability down to drinking water action levels for a number of compounds of concern (COCs). Combined with HPT provides a powerful combination for mapping contaminant distribution and their relationship with hydrogeological environment at the site-wide scale. Proper operation of the Low-Level MIP system with HPT requires an advanced level of understanding of chemistry, chromatography, and pneumatic system controls to ensure system reliability and accuracy. Critical to the proper employment is rigid demonstration of performance and quality control testing throughout the period of system use. When and when not to consider the use of MIP, HPT, and LL-MIP. 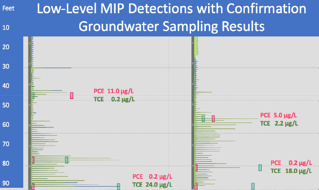 Case examples of where LL-MIP and HPT were combined with other lines of evidence to effectively track and map diffuse low level groundwater contaminant plumes to groundwater action levels. John Sohl, is President & CEO of COLUMBIA Technologies and a Director of Columbia Technologies do Brasil Ltda, both global technology firms. He has managed over 2,000 high-resolution and direct sensing projects around the world over the past 25 years. John is the co-author of three US and two international patents involving direct sensors and the use of real-time information systems. He is 1972 graduate of the U.S. Naval Academy with a B.S. in Engineering and holds a M.B.A. from Chaminade University of Honolulu. John is a member of ASTM International and the Sustainable Remediation Forum. CLICK HERE to schedule a conversation with John or a presentation for your technical team.